You’ve heard all the buzz about invisible braces and Invisalign®, and it’s impressive! Beautiful, straight teeth without metal braces and brackets and in less time. Here are the facts our Discovery Dental team have uncovered about treatment times with Invisalign®. Invisalign® is a revolutionary orthodontic treatment that straightens teeth using a series of custom-created, progressive aligner trays. These trays gently and gradually move your teeth into their desired position. Why do many people prefer Invisalign® over traditional treatment with braces? The aligner trays are made of a clear polymer that doesn’t attract attention to your orthodontic treatment. The trays can be removed to eat, brush and floss, or for a special event. 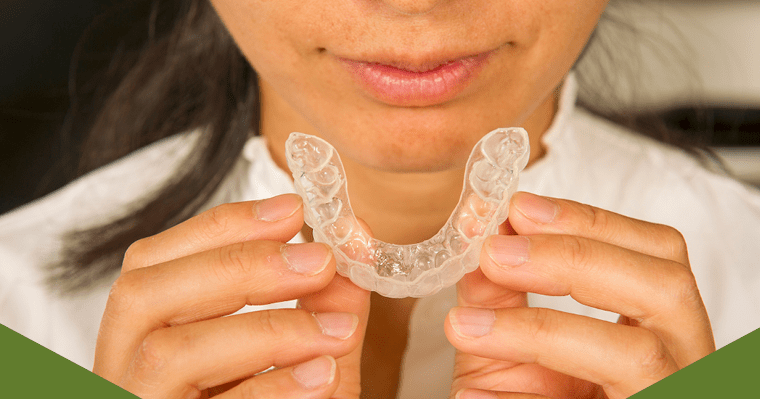 Invisalign® aligners are comfortable to wear. They can be used to correct most orthodontic issues. The Invisalign® website also claims that treatment time is faster. In some cases, up to two times faster! So, is Invisalign® faster for everyone? Here are some of the factors that affect treatment time. Every smile is different and has unique challenges. And that is certainly true when it comes to orthodontic treatment. Generally, the length of treatment with Invisalign® depends on the complexity of your case. The severity of the issue affects the treatment time needed to straighten it out. While Invisalign® can be used on both teen and adults, treatment for adults may take a little longer. On average, teenagers will need treatment for about a year, while most adults may take up to two years. Teenage teeth are more responsive to the aligners and easier to move. Adult teeth usually have more complex issues and are less responsive to treatment. Since treatment with traditional braces for an adult can take anywhere from 18 months to three years, Invisalign® is often still the faster option. Also, Dr. Vanama can speed up the process with the use of Propel Orthodontics. This revolutionary technology can cut your treatment time by as much as three to 10 months. Listen to Kevin’s Invisalign® experience about how fast he was able to have a straighter smile. What other factors can lengthen treatment time? We mentioned earlier that one of the things people love about Invisalign® is the removable aligner trays. But the danger is the temptation to remove it too often! Dr. Madhuri Vanama emphasizes to her Invisalign® patients that to achieve the best results, the aligner trays must be worn 20 to 22 hours a day. So, while the tray can be removed to eat and brush your teeth, it should be immediately put back into place when you are done. The tray must be worn at all other times, even while you sleep. The aligners can only move your teeth if they are in your mouth. By not following these directions, some patients have considerably lengthened their treatment time! Invisalign® Teen makes it easier for a dentist to monitor whether or not a patient is wearing their aligner the correct amount of hours by using blue compliance dots on the trays. These dots will fade as the trays are worn. So teens, make sure to wear your aligners the required amount of time, or your blue dots will tell on you! What can help shorten treatment time? Having a simple orthodontic case helps. If you just need to move a few teeth into proper alignment, treatment will be fairly rapid — usually just a matter of months. Otherwise, the best thing you can do to get your smile faster is to comply with your Issaquah dentist’s instructions on wearing your aligners. When you first start to wear the aligners, your teeth and jaws may feel a little sore. But persevere! The soreness will pass, and you will be on your way to a more beautiful and straighter smile. Taking proper care of your aligners is important also. Brush them twice daily to remove any stuck food particles and deep clean them weekly in a solution of 50% water and 50% vinegar for 20 to 30 minutes. This will keep your teeth and gums healthy and keep your aligners in proper condition. If an aligner becomes damaged or cracked, be sure to tell your dentist so a replacement tray can be made. Using the progressive aligner trays in the correct order is important. Invisalign® aligners are usually switched to the next in the series about every two weeks or so. Make sure to keep to your outlined schedule. Following all of the above suggestions will help you to enjoy your straight smile sooner! How effective is Invisalign® compared to braces? We’ve talked about all the advantages of Invisalign®, but they would be meaningless if Invisalign® didn’t get the job done, right? You don’t have to take our word for it. 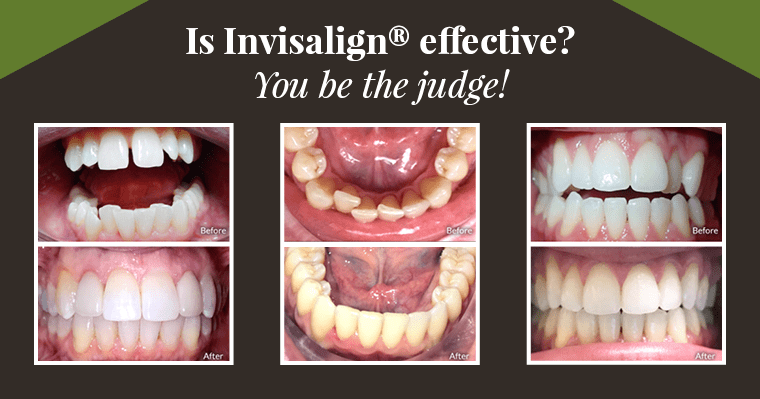 Here are some examples of real patients’ smiles before and after treatment with Invisalign®. You can see for yourself that Invisalign® can produce beautifully straight smiles. Proprietary SmartForce features and SmartTrack material make Invisalign® treatment effective for even complex cases. Are you considering treatment with Invisalign®? Are you wondering how long it will take for Dr. Vanama to work her magic on your smile? No need to wonder anymore! Claim our money-saving special offer below and book a consultation with Dr. Vanama. She will be able to tell you whether Invisalign is the right choice for you and how long you can expect your treatment to last. When you sign-up for Invisalign® treatment at our Issaquah, WA dental office, you will receive $2,400 off. What are you waiting for? Take advantage of this special offer before it’s too late!